Here is our analysis of the new Agricultural Policy issued by the Hong Kong government. The government is proposing to spend HKD 7 billion to encourage the development and growth of the agriculture sector by establishing a 80 hectare “Agri-Park”. While this is all well and good, the first question we must ask is: what is the governments track record in nurturing sectors other than real estate? The Pantheon of government schemes that produce nothing (other than taxpayer funded or subsidised construction projects) includes: the Science Park, the EcoPark, a CyberPort, an Innocentre and numerous others. The government will acquire privately-owned agricultural land (including land within the country park zone) from landowners to build the Agri-Park. In a market economy, when supply is fixed and demand increases (due to the government entering the market as a large buyer), prices will rise. The resulting increase in land rental cost will in effect be detrimental to existing farmers. This scheme will hurt the farmers that it is purportedly trying to help. In this case the pain will be borne by the farmers and gain will be reaped by the construction industry, landowners and bureaucrats. A farmer’s investment is largely comprised of his time and effort in improving the land. Through weeding, cultivation, and enrichment of the soil a farmer creates an environment optimal for plant growth. Unlike a software company incubated in a technology park, the farmer cannot simply move. This scheme can only have been thought up by “innovative” bureaucrats whose experience of farming consists largely of playing FarmVille. A google search of the term “agri or agriculture park” will result in finding a few tourist attractions and only one park in Hawaii that maybe similar, where the lease terms however range from 15 to 45 years. The reason that Agri-Parks, like Mining Parks, generally don’t exist is because they make absolutely no sense. Farming like mining is by its very nature tied to the land on which it occupies. If after the proposed 5 year tenancy, the government has by some miracle incubated a corp of successful farmers that are ready to move to the next level, where would they in fact move to when land costs outside the Agri-Park are actually higher due to its very creation? Finally, the government is proposing to assist farmers by showcasing the latest in agricultural technology and methods. This showcase already exists, it is called the Tai Lung Experimental Farm in Sheung Shui. The “experts” that staff this place are presumably those that will also help the farmers in the new Agri-Park. These so called experts have as much knowledge about farming as I have about quantum mechanics. They spend most of their time in air-conditioned offices, while sending out the most junior staff. Within the production farming community, where knowledge, skill and hard work are valued, the AFCD is widely despised. The so called “high tech” farming methods are capital and energy intensive. They are deployed in countries that have strong food security policies and food safety enforcement, such as Japan. A reasonable return on the capital invested cannot be achieved so long as the government does not do its primary job: ensuring food safety by preventing cheap vegetables laced with pollution and hazardous pesticides from crossing the border. 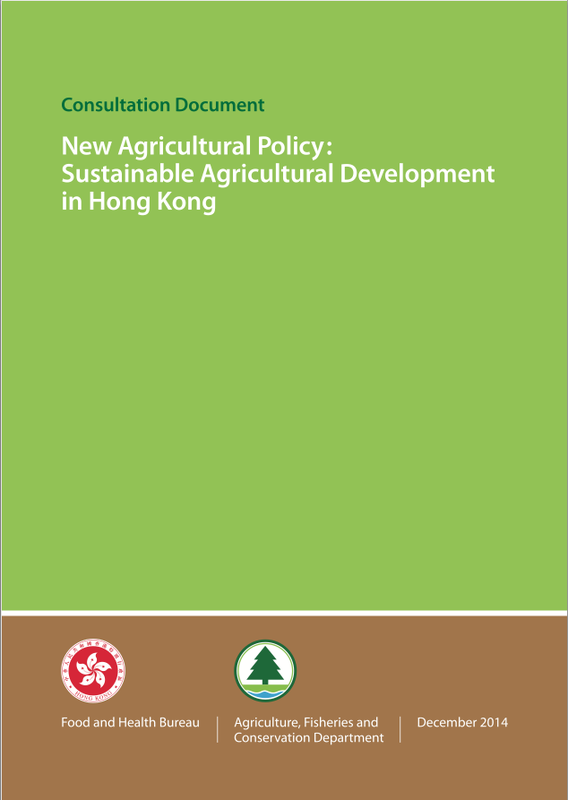 We encourage readers to email their views to the government at agri_policy@afcd.gov.hk before March 31. The proposal to create a 80ha mini ‘agriculture park’ appears a red herring in response to the many calls for an agriculture policy. Is the proposal for a 80ha disneyfied farm project in fact a proposal to rezone all other agriculture land for development? Most of the 4,523 hectares of agricultural land is hoarded by property developers. Only 729 ha of land is under active farming, and primarily by subsistence tenants. Owners consider agriculture temporary and an effective means of keeping the ecological value low (vegetation removal / management) so it is easier to get the land zoned for development later. Sustainable and quality farming operations on our agricultural land will only start to happen once the expectation of future development on agricultural land is addressed. None of this has been highlighted in the consultation document. – Why do we want to safeguard land for agriculture – Food security? Food safety? Letting retired people play with farmville? – How many hectares (anywhere between the 80 and 4,523) of our scarce land do we want to protect for agriculture purposes? Where is that land?